عارفی, محمد. (1395). تاثیر بستر ویسکو-پاسترناک بر ارتعاش ورق سه لایه با یک هسته مدرج و لایه های مدرج پیزوالکتریک. نشریه پژوهشی مهندسی مکانیک ایران, 18(3), 78-95. محمد عارفی. "تاثیر بستر ویسکو-پاسترناک بر ارتعاش ورق سه لایه با یک هسته مدرج و لایه های مدرج پیزوالکتریک". نشریه پژوهشی مهندسی مکانیک ایران, 18, 3, 1395, 78-95. عارفی, محمد. (1395). 'تاثیر بستر ویسکو-پاسترناک بر ارتعاش ورق سه لایه با یک هسته مدرج و لایه های مدرج پیزوالکتریک', نشریه پژوهشی مهندسی مکانیک ایران, 18(3), pp. 78-95. عارفی, محمد. تاثیر بستر ویسکو-پاسترناک بر ارتعاش ورق سه لایه با یک هسته مدرج و لایه های مدرج پیزوالکتریک. نشریه پژوهشی مهندسی مکانیک ایران, 1395; 18(3): 78-95. مقاله حاضر به بررسی مشخصه های ارتعاشی ورق ساخته شده از یک هسته مدرج الاستیک و مجهز شده به دو لایه مدرج پیزوالکتریک می پردازد. سازه مورد بررسی بر روی بستر الاستیک خطی ویسکو-پاسترناک قرار گرفته است. تمام خواص مکانیکی و الکتریکی به غیر از ضریب پواسون در راستای ضخامت و بر اساس تابع توانی تغییر می کند. پتانسیل الکتریکی سه بعدی در سه راستای ورق درنظر گرفته می شود. نتایج بدست آمده شامل مشخصه های ارتعاشی سیستم الکترومکانیکال می تواند اثر پارامترهای مکانیکی مختلف و همچنین اثر پارامترهای مختلف بستر را نشان دهد. Chen, W. Q., Bian, Z. G., and Ding, H. J., "Three-dimensional Vibration Analysis of Fluid-filled Orthotropic FGM Cylindrical Shells", International Journal of Mechanical Science, Vol. 46, pp. 159–171, (2004). Kadoli, R., and Ganesan, N., "Buckling and Free Vibration Analysis of Functionally Graded Cylindrical Shells Subjected to a Temperature-specified Boundary Condition", Journal of Sound and Vibration, Vol. 289, pp. 450–480, (2006). Kadoli, R., Ganesan, N., and Padmanabhan, C., "Linear Thermoelastic Buckling and Free Vibration Behavior of Functionally Graded Truncated Conical Shells", Journal of Sound and Vibration, Vol. 292, pp. 341–371, (2006). Prakash, T., and Ganapathi, M., "Asymmetric Flexural Vibration and Thermoelastic Stability of FGM Circular Plates using Finite Element Method", Composites Part B-Engineering, Vol. 37, No. 7-8, pp. 642-649, (2006). Liew, K. M., Yang, J., and Wu, Y. F., "Nonlinear Vibration of a Coating-FGM-substrate Cylindrical Panel Subjected to a Temperature Gradient", Computer Methods in Applied Mechanics and Engineering, Vol. 195, pp. 1007–1026, (2006). Hui-Shen, S., "Nonlinear Thermal Bending Response of FGM Plates Due to Heat Conduction", Composites Part B-Engineering, Vol. 38, pp. 201–215, (2007). Efraim, E., and Eisenberger, M., "Exact Vibration Analysis of Variable Thickness Thick Annular Isotropic and FGM Plates", Journal of Sound and Vibration, Vol. 299, pp. 720–738, (2007). Allahverdizadeh, A., Naei, M. H., and Bahrami, M., "Vibration Amplitude and Thermal Effects on the Nonlinear Behavior of Thin Circular Functionally Graded Plates", International Journal of Mechanical Science, Vol. 50, pp. 445–454, (2008). Allahverdizadeh, A., Naei, M. H., and Bahrami, M., "Nonlinear Free and Forced Vibration Analysis of Thin Circular Functionally Graded Plates", Journal of Sound and Vibration, Vol. 310, pp. 966–984, (2008). Li, Q., Iu, V.P., and Kou, K. P., "Three-dimensional Vibration Analysis of Functionally Graded Material Sandwich Plates", Journal of Sound and Vibration, Vol. 311, pp. 498–515, (2008). Huang, Z. Y., Lü, C. F., and Chen, W. Q., "Benchmark Solutions for Functionally Graded Thick Plates Resting on Winkler–Pasternak Elastic Foundations", Composite Structures. Vol. 85, No. 2, pp. 95–104, (2008). Ebrahimi, F., and Rastgo, A., "An Analytical Study on the Free Vibration of Smart Circular Thin FGM Plate Based on Classical Plate Theory", Thin Walled Structures, Vol. 46, pp. 1402–1408, (2008). Malekzadeh, P., and Vosoughi, A. R., "DQM Large Amplitude Vibration of Composite Beams on Nonlinear Elastic Foundations with Restrained Edges", Communication in Nonlinear Science and Numerical Simulation. Vol. 14, pp. 906–915, (2009). Khoshgoftar, M. J., Ghorbanpour Arani, A., and Arefi, M., "Thermoelastic Analysis of a Thick Walled Cylinder Made of Functionally Graded Piezoelectric Material", Smart Materials and Structures, Vol. 18, No. 11, pp. 115007 (8), (2009). Benyoucef, S., Mechab, I., Tounsi, A., Fekrar, A., Ait Atmane, H., and Adda Bedia, E. A., "Bending of Thick Functionally Graded Plates Resting on Winkler–Pasternak Elastic Foundations", Mechanic of Composite Materials, Vol. 46, No. 4, pp. 425-434 , (2010). Ait Atmane, A., Tounsi, H., Mechab, A., and Adda Bedia, I., "Free Vibration Analysis of Functionally Graded Plates Resting on Winkler–Pasternak Elastic Foundations using a New Shear Deformation Theory", International Journal of Mechanic and Materials in Design, Vol. 6, No. 2, pp. 113-121, (2010). Zenkour, A. M., "Bending of Orthotropic Plates Resting on Pasternak’s Foundations using Mixed Shear Deformation Theory", Acta Mechanica Sinica, Vol. 27, No. 6, pp. 956-962, (2011). Rahimi, G. H., Arefi, M., and Khoshgoftar, M. J., "Application and Analysis of Functionally Graded Piezoelectrical Rotating Cylinder as Mechanical Sensor Subjected to Pressure and Thermal Loads", Applied Mathematics and Mechanics (English-Edition), Vol. 32, No. 8, pp. 1–12, (2011). Zenkour, A. M., Allam, M. N. M., and Radwan, A. F., "Bending of Cross-ply Laminated Plates Resting on Elastic Foundations under Thermo-mechanical Loading", International Journal of Mechanic and Materials in Design, Vol. 9, No. 3, pp. 239-251, (2013). 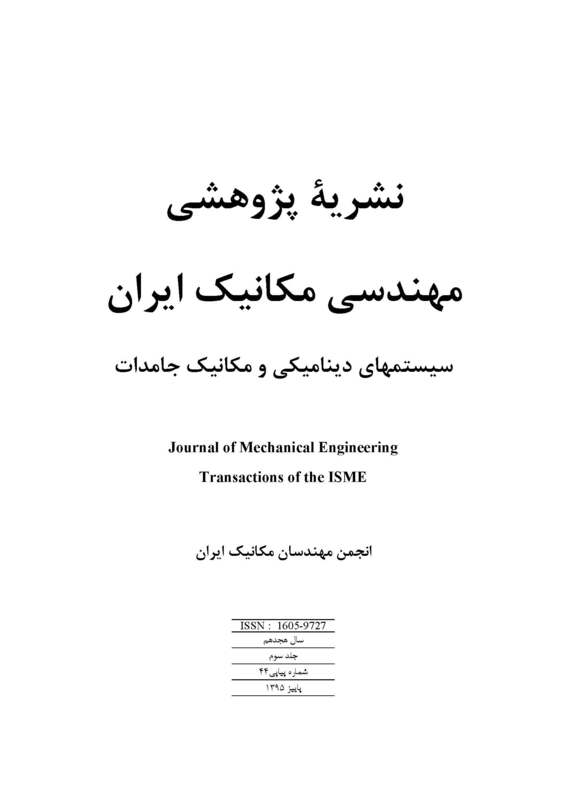 Ghorbanpour Arani, A., Bagheri, M. R., Kolahchi, R., and Khoddami Maraghi, Z., "Nonlinear Vibration and Instability of Fluid-conveying DWBNNT Embedded in a Visco-Pasternak Medium using Modified Couple Stress Theory", Journal of Mechanical Science and Technology, Vol. 27, No. 2, pp. 2645-2658, (2013). Ghorbanpour Arani, A., and Shokravi, M., "Nonlocal Vibration Behavior of a Viscoelastic SLGS Embedded on Visco-Pasternak Foundation under Magnetic Field", Journal of Nano Structures, Vol. 3, No. 4, pp. 467-476, (2013). Ghorbanpour Arani, A., Shiravand, A., Rahi, M., and Kolahchi, R., "Nonlocal Vibration of Coupled DLGS Systems Embedded on Visco-Pasternak Foundation", Physica B: Condensed Matter, Vol. 407, No. 21, pp. 4123–4131, (2012). Zenkour, A. M., Allam, M. N. M., Shaker, M. O., and Radwan, A. F., "On the Simple and Mixed First-order Theories for Plates Resting on Elastic Foundations", Acta Mechanica, Vol. 220, No. 1-4, pp. 33-46, (2011). Zenkour, A. M., and Radwan, A. F., "On the Simple and Mixed First-order Theories for Functionally Graded Plates Resting on Elastic Foundations", Meccanica, Vol. 48, No. 6, pp. 1501-1516, (2013). Areﬁ, M., and Rahimi, G. H., "Nonlinear Analysis of a Functionally Graded Square Plate with Two Smart Layers as Sensor and Actuator under Normal Pressure", Smart Structures and Systems, Vol. 8, No. 5, pp. 433–446, (2011). Areﬁ, M., and Rahimi, G. H., "Studying the Nonlinear Behavior of the Functionally Graded Annular Plates with Piezoelectric Layers as a Sensor and Sctuator under Normal Pressure", Smart Structures and Systems, Vol. 9, No. 2, pp. 127–143, (2012). Arefi, M., "Nonlinear Thermoelastic Analysis of Thick-walled Functionally Graded Piezoelectric Cylinder", Acta Mechanica, Vol. 224, pp. 2771–2783, (2013). Ghorbanpour Arani, A., and Shokravi, M., "Vibration Response of Visco-elastically Coupled Double-layered Visco-elastic Graphene Sheet Systems Subjected to Magnetic Field via Strain Gradient Theory Considering Surface Stress Effects", Proceedings of the Institution of Mechanical Engineers, Part N: Journal of Nanoengineering and Nanosystems, Vol. 229, No. 4, pp. 180-190, (2015). Hosseini Hashemi, Sh., Mehrabani, H., and Ahmadi-Savadkoohi, A., "Exact Solution for Free Vibration of Coupled Double Viscoelastic Graphene Sheets by ViscoPasternak Medium", Composites Part B: Engineering, Vol. 78, No. 1, pp. 377–383, (2015).